The Danish branch of the World Wildlife Fund is taking advantage of the fleeting nature of Snapchat to illustrate just how quickly it takes for an endangered species to be wiped off this planet. 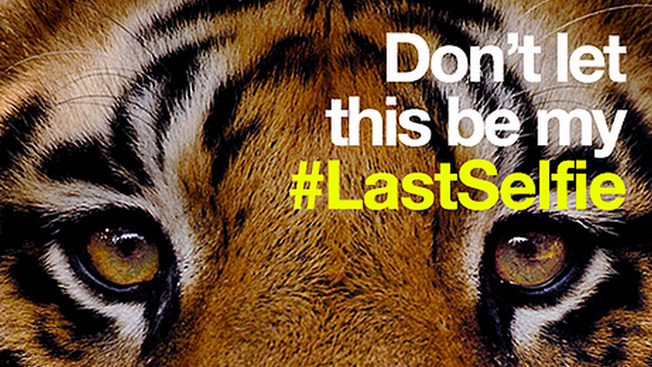 Taking a sobering spin on the selfie that seems to have become so pervasive in marketing, the #lastselfie ads feature one of five different endangered animals. They all send the same message, "Don’t let this be my #lastselfie." The animal conservation organization is encouraging users of the photography app to take a picture of its bleak ads and Snapchat it to their friends. “In a way Snapchat is a mirror of real life. The images you see are transient, instant, unique, yet only live for a few seconds. Just like these endangered animals,” a video for the #lastselfie campaign reads. The #lastselfie campaign was done in conjunction with agencies UncleGrey and 41? 29!